It’s no secret that I love classic films, and that I especially love watching them on Turner Classic Movies. I’ve discovered so many great movies on this beloved channel, but perhaps my favorite discovery that can’t be topped is the 1938 romantic comedy Vivacious Lady, starring Ginger Rogers and James Stewart. Before I get more into this movie and why it’s so special to me, let me give a little backstory into how I got into that golden era of Hollywood. I’ve always loved movies growing up, and I watched a good number of the classics. From the Marx Brothers comedies to my favorite movie of all time, Singin’ in the Rain, I enjoyed these movies that my dad would play for me every now and then (sometimes even on TCM). Truth be told though, I didn’t really delve into studio era films until about five years ago when I took a film history class in college. After watching some of the most acclaimed films of all time that semester, I took it upon myself to spend more time watching older movies. Peter (James Stewart) checks out Francey’s (Ginger Rogers) nightclub performance. 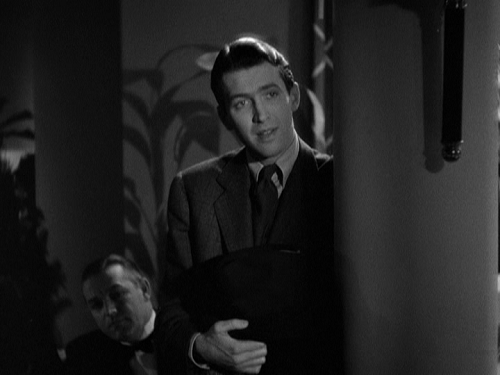 I especially grew fond of Jimmy Stewart after watching Rear Window and Vertigo thanks to that class. I had previously seen him in It’s a Wonderful Life and fell in love with him and George Bailey. In the year following that class I just had to see more of him. I looked on TCM’s website to see if any of Stewart’s movies were playing soon and found Vivacious Lady, co-starring Ginger Rogers, an actress whose films I’d never seen, and whom I’d only heard of through her association with Fred Astaire. The movie is only 90 minutes long, so I thought I might as well check it out! Francey and Peter can’t keep their eyes off each other. 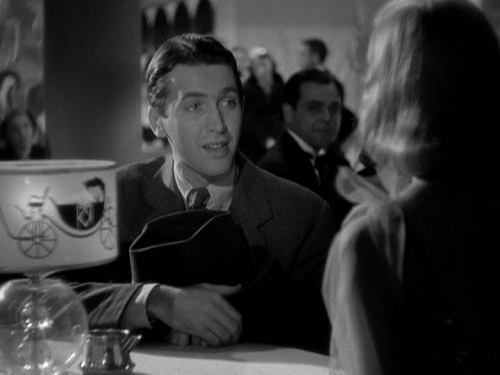 Vivacious Lady revolves around a whirlwind romance, where young university professor Peter Morgan (James Stewart) falls for nightclub singer Francey (Ginger Rogers) on a quick trip to the city. After a night of stimulating conversation, they decide to get married. Upon bringing his new bride home, Peter and Francey have to face the obstacles that may prevent their happiness. As this is a romantic comedy, amusing missteps ensue and all turns out alright in the end. Francey continues to charm Peter as she eats corn on the cob. As I mentioned earlier, this was my introduction to Ginger Rogers, and this was really a great way to see her in a movie for the first time. She’s of course most known for being Fred Astaire’s dance partner, but since watching more and more of her movies, she’s proven to be both a great comedic and dramatic actress. In this film, she mostly showcases her comedy chops, but she also provides a little singing and dancing. In 1938, Rogers was at the top of her game, and she was two years away from winning an Oscar for Kitty Foyle. Francey is caught in a compromising position with Peter’s ex-fiancée. 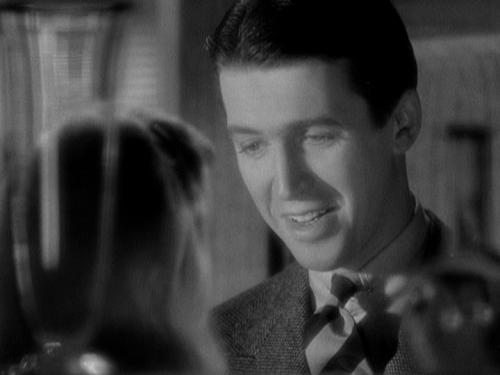 Interestingly enough, James Stewart was also two years away from winning his only Oscar for The Philadelphia Story. I love this re-issue trailer for the movie because it boasts how 1940’s Best Actor and Best Actress winners starred in this movie together two years prior. Unfortunately for us, this is the only movie the two stars did together; their chemistry here is undeniable and they undoubtedly would’ve been great in other movies together. Their on-screen chemistry is partly due to the fact that Stewart and Rogers were dating at the time, so I think this also helped sell how much their characters cared for each other, despite only knowing each other for such a brief time. Peter assures Francey that everything will go their way soon. At this point in time, Stewart was just getting around to becoming a leading man, and usually played the all-American, boy-next-door type. He puts on the same boyish charm here, and it’s easy to see how Francey fell in love with Peter so quickly. 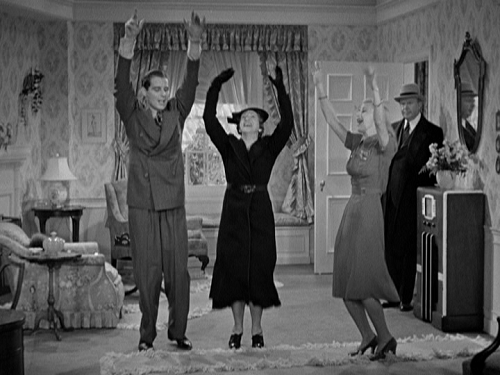 You can watch the scene in which it’s practically love at first sight for Peter and Francey here, which features Rogers’ only singing number in the movie. The cast also features a couple of Hollywood’s best supporting actors of the time. Beulah Bondi plays Stewart’s mother for the second time on film, and eventually went on to play his mother in two Frank Capra classics: Mr. Smith Goes to Washington and It’s a Wonderful Life. She has a couple of good scenes, and I especially love the ones she shares with Rogers. Peter’s mother (Beulah Bondi) and Francey bond over a split cigarette. One of my favorite character actors is Charles Coburn, and Vivacious Lady was the first time I had seen him in a movie. Here he plays Stewart’s conservative father, who happens to be the president of the university Peter works for. Francey doesn’t leave a good impression on him because she’s a nightclub singer, making him the biggest obstacle the couple faces in trying to cement their happiness together. 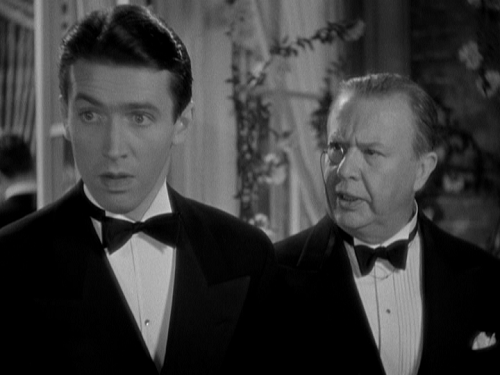 Peter’s father (Charles Coburn) isn’t happy with what his son has to show him. I also have to mention that this movie is directed by George Stevens, a fantastic director who has helmed many classics, including The More the Merrier, Giant, and Swing Time, which is possibly the best Astaire-Rogers film collaboration. Before seeing Vivacious Lady, the only film of his I had seen was The Diary of Anne Frank in my 8th grade English class. As I’m sure TCM will discuss in their Five Came Back series later in the month, Stevens often directed lovable comedies in the 1930s and 1940s before exclusively directing more dramatic films after World War II. Despite the light-hearted subject, this film is no exception in showing his knack for direction, as all the actors work together wonderfully, and the story flows well. It also features a few really interesting shots, especially in the way Francey and Peter are framed. The film’s cinematographer, Robert De Grasse, was in fact nominated for an Oscar for his work here. Francey finds it difficult to learn about botany when her husband is the teacher. I’ve seen the film a couple more times since I first saw it a few years ago (including last year for James Stewart’s day during TCM’s Summer Under the Stars). I still love it as much as I did the first time, if not more so. Unfortunately it’s not scheduled to play on the channel for the rest of the year, but if you ever happen upon it and you haven’t seen it yet, I urge you to check it out, I promise you’re in for a good time! Peter’s cousin Keith (James Ellison), his mother and Francey have a dance party. To bring this all full circle, I see Vivacious Lady as my first real TCM discovery since my growing love for classic films started five years ago. The movie is quite unheard of among general audiences today, and isn’t well-known among the expansive filmographies of director George Stevens and stars Ginger Rogers and James Stewart. I don’t think I would have discovered this underrated gem if it weren’t for Turner Classic Movies, and for that alone I am grateful to them. The channel is amazing not only for showing us why movies like Casablanca are classics, but also for shining a light on great movies that are below the radar. Peter and Francey share a tender moment on the train just after getting married. I wrote this entry as a part of the TCM Discoveries Blogathon, where many bloggers are discussing the great movies they found thanks to the channel. Click the banner below and read more stories, and of course share the movie love! I’ve always heard such great things about this film. So many people love it, and I’d like to see Jimmy and Ginger together. Wonderful write up! Thanks Simoa! I hope TCM plays the movie early on next year so you can check it out. A nice article, Keisha, and it really shows how much you love this film. I’ve heard of it, but have never seen it, so now I’ll have to track it down, thanks to your glowing review! Thank you for the kind words Todd! I’m glad to get more people interested in this little gem of a film. I love this movie more than words can say. It is incredibly good, and I cannot believe it isn’t more well-known. Jimmy and Ginger were a marvelous team — I wish they had done more together. Like you, I found this gem through TCM and I couldn’t be more grateful. Great post! Thank you Michaela! Considering that Jimmy and Ginger are among the more well-known classic movie stars today you’d think this movie they did together would be better known. I am glad that it’s not a completely forgotten movie though, and that TCM does air it every once in awhile! I’m another one who’s heard – but never seen – this film. Your enthusiasm is contagious. I’m adding this to my priority list too! This comes on TCM March 2! I haven’t seen this one yet so I’ll be sure to watch it! I love Charles Coburn!